Bashar al-Assad: India and China should play a role with other countries in making a balance that we have missed for almost 20 years. 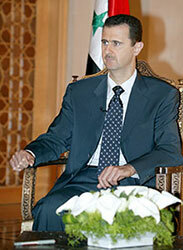 At 42, President Bashar al-Assad of Syria is the youngest head of state in West Asia and also one of its most influential. On the eve of his visit to India, he spoke exclusively to The Hindu about Syria’s relations with Israel and Lebanon, U.S. allegations about a clandestine nuclear programme and his hopes of India playing a more important role in bringing peace to the region. Your government recently confirmed that there have been indirect talks between Syria and Israel through Turkey. Now, Israel is occupying the Golan Heights – which is Syrian territory -- and obviously Syria is asking to get its territory back. But what can Syria give to Israel in return? First of all, as you said, Syrian land is occupied by Israel so they have to give us back our land. We don't have something to give but we have something to achieve together, which is peace. It is not something we have. So, if both sides achieve a certain treaty, including giving back the Golan Heights, this means achieving peace. The other thing besides the land is discussing normal relations, water, security arrangements and all these details that are related to the concept of peace. As I said, it is something we achieve together, but Israel has the land and should give it back. 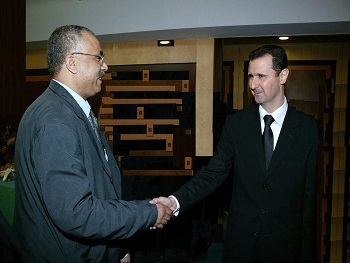 But it is said that Israel wants Syria to abandon its friends in the region – friends like Hamas, Hizbollah and Iran. What is the Syrian response? Nobody asked us to do this. The Israelis have been talking about negotiations without pre-conditions. So, they cannot ask for conditions for the negotiations, and they have not asked either. This is first. Second, Hamas is related to the Palestinian Track and we are talking about the Syrian track; we are not responsible for that track. Hizbollah is part of the Lebanese track and we are not in Lebanon today. So, we are only talking about the Syrian track. This is our position. Jimmy Carter stated recently that 85% of the issues linked to the Israeli occupation of the Golan Heights have been sorted out. What is left is the question of the last 15%? Is that an accurate assessment? You mean during Rabin's government? What do you think is the Israeli compulsion to talk peace with you at this time? It seems that the Americans themselves are not very happy with what Israel is doing. What do you think is motivating Israel to take this step right now? As an outside observer, it seems strange that you can be talking peace with Israel a few months after Israel bombed your territory at al-Kibar, claiming they targeted a secret nuclear facility. Is this one of the issues you raised with them – that how could they have bombed your territory? No we did not. Of course, we have not met with them because it is an indirect negotiation. But, the question here is why did they announce it seven months after the bombing? Why did they not announce it at that time in order to send a delegation from the IAEA to see what is happening? Let us put it this way: they said there was a facility and they bombed this facility and now they have the evidence. How could we not have this evidence seven months ago? Why do they have the evidence today? Because after seven months you could say that Syria built that facility and now it is demolished and they rebuild it in a different way; this is their excuse. While if they gave this alleged evidence at that time, their story would not have been proved genuine or credible. So, this is their ploy, and we did not raise this issue, and we said that time that this is an evidence for us that the Israelis are not serious about peace. That is why we talked about indirect not direct negotiations. It is like probing the intention of the Israeli side; are they serious in giving back the Golan Heights to Syria or is it just a tactic or maneuver for internal Israeli politics. That is why we did not raise the issue and we did not have the chance anyway to meet with them. But we raised it with the IAEA. So what was the nature of that facility? President Assad: It is a military facility, and I announced this, but what the content of that facility is, you do not usually announce a military content. But it is not nuclear; how could it be nuclear, where are the radiations, where are the protections of this facility? How can you build such a facility under the daily watch of satellites? We know that. So it is not nuclear but completely a different issue. Why did the Israelis bomb it? President Assad: I think because they did not know about it; they were suspicious about its content and they could not know. I cannot answer on their behalf; you should ask them. I think they had wrong information; they were entrapped. How they should explain to the Israelis and the rest of the world why they bombed it? This is where they created this story of a nuclear facility. At the beginning they said that this is a site where they can bring armaments to Hizbollah, but how? It is in the middle of Syria and you have Turkey in the north and Iraq in the east. How can you bring the armaments to Hizbollah? From Turkey, or from Iraq where the Americans operate? This is not logical. Then they said that this is where the Turks used this site, but later; I think a month ago, they said it is nuclear. So, it was clear that they did not have any evidence that it is a nuclear site; they created this evidence through manipulation on the computer that this is a copy of the North Korean plants. So, this so-called photographic evidence and video evidence which indicated that this was a plutonium producing plant made with North Korean help – all of this is fabricated? President Assad: Yes it was fabricated 100%. Of course, they talked about photos of Koreans in Syria, but we have normal relations with North Korea; we receive them formally and publicly, and I receive them and other levels in the government. I received North Korean officials, scientists and whatever. So, this is not true. One of the reasons why the world got a little bit suspicious about this issue is that the Syrians moved quickly to clean up the site. What was the need for that? I mean you should have actually been proactive even in September last year to invite the international community to see the Israeli aggression, for example. Why did you keep quiet for so long and why was this site cleaned up? First of all, they did not say at the beginning it was a nuclear site and there were few weeks. Second, it was attacked by missiles; you do not keep it as it is, so we rebuilt it. We did that right away; after the attack by few days, we started rebuilding the site. So, it is something normal to remove the debris and have another site. So the facility was rebuilt basically? What about the debris? May be in a different or the same site; it is a military issue and we do not usually announce what it is. May be it is different building for another purpose. I know you invited IAEA to visit the site. Now the US has said that that site is not enough and they should be allowed to visit other sites. Why would the Americans make that demand and what is your response to that? We have an agreement between Syria and the Agency and every procedure implemented in Syria should be according to this treaty. According to this treaty, you cannot just come and visit any place according to intelligence information; you cannot. Because every day they may come to the Agency and say we have this information. So, it is a never-ending problem. So, we usually come with certain evidence to see the suspicious place. Actually, they did not come because it is a suspicious place; they did not bring any convincing evidence, I mean the Americans, but we said that we have an interest to bring the Agency to come to this site, but talking about other sites is not within the purview of the agreement. So, we have to be very precise; it is not political but technical issue. And we have a nuclear board or commission that has an agreement with them and they work within this agreement. So, do you think that the US is trying to create an atmosphere of suspicion against Syria? Yes, because this is the image of this administration; everybody in the world still remembers what happened in Iraq when they had all that evidence, but then it was proved that everything was fabricated; even Colin Powel confessed in an interview that he was not truthful, and we all know the same, and most of the countries know about the problem between Syria and the US, and they always try to find traps for Syria. This is reality. One of the speculations is that this Israeli attack was linked to judging their own preparedness for an attack on Iran? Have you heard this story? Yes, but nobody can tell what is the real intention of that attack. Your Excellency, turning to Lebanon, the Doha Accord has been seen as a major victory not just for the different Lebanese political players but also for Syria's policy. Do you think the Doha Accord and the new coalition agreement will mark the opening of a new chapter in Syrian-Lebanese relations? Definitely, yes from different aspects. The first aspect as you mentioned, it is a victory for the Lebanese. This is so because Syria protected itself; when you have chaos, conflict, civil war and whatsoever in Lebanon we will be affected directly, this is the first victory. 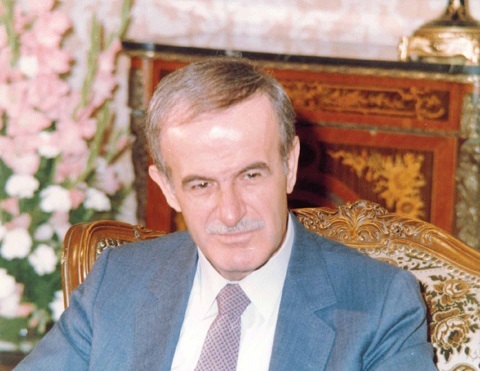 The second victory is that many Lebanese and many officials around the world used to accuse Syria of creating problems in Lebanon, and that we have an interest in creating these problems and having conflicts in Lebanon, but the Doha Accord which was supported directly by Syria was a stark proof that Syria is working in the other direction, not like what they used to mention; this was very important for Syria. And even the proposals we used to propose few months ago before solving the problem were the same proposals the Doha Accord depended on. So, we were proved to have the vision for a safe Lebanon. Do you think if things move fast, you will make a visit to Beirut? Yes, and about the other aspect as I mentioned because we proved that, we can see now that many Lebanese noted that Syria is working for the sake of Lebanon; the interests of Syria and Lebanon are common. So, the relations should move in the right direction to be better in the future. 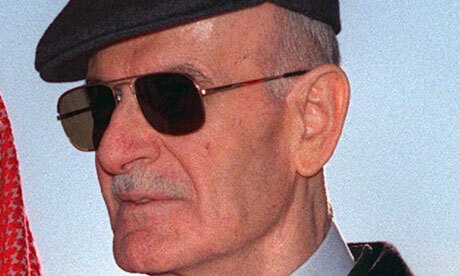 But the visit of the president, this is related to the formation of the national unity government in Lebanon first. Second, this is related to the discussion between me and the Lebanese president; we have not had any discussion about my visit. But, when I spoke to him after the Doha Accord, I told him that we are ready to help Lebanon and help him personally in his mission. He said we want the help of the Syrians in the future and we said we are ready; we are still waiting. And will this lead to opening an embassy in Beirut? Yes, and we mentioned this three years ago and we said that we do not have any problem. But, the problem is that if you have bad relations with any country, you usually withdraw your ambassador and close the embassy. So, how do you open an embassy with a country or government with whom you have bad relations not good ones? 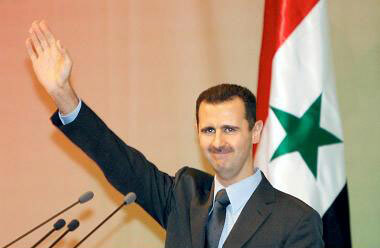 Now, when they have this national unity government, it is going to be normal for Syria to open an embassy in Lebanon. I have been struck by the paradox in Syria's policy where internally Syrian society is very strongly secular and you oppose sectarian politics and you do not allow that kind of politics in your country, but most of your best friends in the region all come from sectarian backgrounds like Hamas, Hizbollah and even the Iranians. Is this a problem for Syria? Actually in politics, you have to be pragmatic; the first question that you have to ask is who is effective in our region, you do not ask who is like you or who is not. Hamas is effective and important in Palestine. Hizbollah is a very important party in Lebanon, and Iran is a very important country in the region. Without those players, you cannot have stability, you cannot have any solution and you cannot reach anything you are looking for. So, whether you like it or not, or whether you agree with or disagree, you have to deal with them. You do not say like this administration 'black and white', 'evil and good' and things like this; this does not work like this in politics. If you want to solve problems, you have to deal with the players. The Iranians were not very happy when Syria took part in the Annapolis Conference and I would imagine they are not happy with the indirect talks with Israel. Have you had any feedback from Tehran? We were not very happy with Annapolis Conference too! This is because we knew that this is not a serious administration; we knew in advance from subsequent events that they are not serious towards the peace and they announced that many times. They said we are not interested in the Syrian track recently even after Annapolis. So, we knew that these events were window dressing just to tell the American people that we are working for peace. For us, it was important to bring up the issue of the Golan again on the international podium because most of the world was in Annapolis. 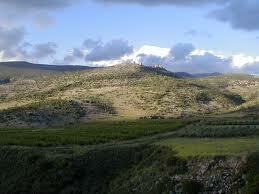 That's why we had to go in order to put the Golan on the table, but at the same time we were not happy. And now after 6 or 7 months nothing happened on any track. Again, this is a Syrian issue and Iran does not interfere in Syrian issues; they support the Syrian cause whether we are happy or they are happy, and that's why the relations between Syria and Iran are very strong. And in the 1980s most of the world was supporting Saddam Hussein, including the US, against Iran and we were one of very few countries in the world to say that Iran was right at that time and Saddam was wrong. Now, the rest of the world says we were right at that time. So, Iran never forgets that we supported them at that time when the rest of the world used to be against them. That is why the relation is very strong between Syria and Iran. Varadarajan: Turning to the UN tribunal being set up in The Hague to deal with the assassination of Rafik Hariri, do you have confidence that it will work objectively? President Assad: If it is not politicized, we should say it is trustworthy and it should solve the problem and who are the criminals. But, usually like any other investigation, you should have forensic evidences in order to have this tribunal, and that is why they said now that they are going to extend the mission of the delegation in Lebanon. This means that things are moving on the right way so far. We hope this tribunal to be a very professional tribunal not politicized one. But, based on the Mehlis report, do you fear there is an attempt to frame Syria? I think that the reports which came after Mehlis have refuted completely what Mehils said. That is why we feel relaxed and everything is going on in a professional way. So, the Syrian authorities will fully cooperate once the tribunal gets on the way? President Assad: Definitely, and they mentioned that many times in their reports that the Syrian cooperation was satisfactory. What would happen if the tribunal asks for Syrian citizens to be sent there for trial? Usually they should have an agreement, like what happened with Lebanon when they formed the tribunal; there was an agreement between the Lebanese government and the United Nations and now they must have another agreement between them and between Syria because we have our jury and we have our sovereignty and our judicial system which we will not replace by another one whatsoever. So, there must be an agreement between Syrian and the United Nation about this cooperation. Do you think post-Doha that the Lebanese government will be in a stronger position to influence the tribunal and make sure that it goes in the right direction? Of course if you have a unity government formed in Lebanon that will mean that the tribunal should work professionally and not in a politicized way. This is an important guarantee and this means that you have consensus in Lebanon about certain issues, and if you have this consensus, it means that the tribunal cannot be politicized. You are right, this is about the government not about the opposition. Turning to your forthcoming visit to India, what are you expectations? Your father came to India in 1978. Many people remember that visit. Mr Vajpayee came here in 2003 and relations have been ongoing. What are your expectations now from your visit? Now we are talking about a different India. We are talking about the rise of India. With the rise of India and China we have a different Asia and a different world. We have, let us say, more hopes than we had in the past. Maybe the policies of India at that time were different as part of the non-aligned movement. At that time we used to look at India as a closer country, but now we see it a big country, an important country; so we have different hopes but in the same way. So, the question is what role can India play in the world, especially regarding our issues, like the peace issue, the Iraq and Palestine issues and all these problems. How we can cooperate on them. So, this is about politics. India and China should play a role with other countries in making a balance that we have missed for more than 18 years now. It is almost 20 years, because this happened in the late 1980s, even before the dissolution of the Soviet Union. So you think if India were to involve itself in the peace process issue, this could bring about a balance? Yes, because it has two aspects: the first aspect if you are interested, you can play a direct role between the two sides, Syria and Israel, and the Palestinians and Israel. That will make the region more stable, and that will affect India itself in the long run and the world at large, especially Asia. Second, it's about the role that you can play through your weight or your position as India, a big country, in making dialogue with other powers of the world, that is the United States then Europe, your region. How can you help the Middle East become more stable; because you are going to be affected by our problems anyway, and you are already affected I think. What is happening in Indonesia cannot be separated from what is happening in Palestine, for example, especially in the Muslim world. So that is how we see the Indian role from the political point of view. Everybody knows about the huge development that you have in India, especially in the IT field. 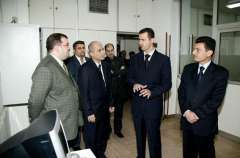 I am interested in this because I was head of the Syrian Computer Society which is a Syrian NGO before I became President. And I think that developing countries cannot achieve much in the field of hardware, but they can achieve a lot in software because it is about the brains and we have the brains. We just need to provide the appropriate environment to develop, and this is where India can help. Third, it is about bilateral relations, about investment, how we can attract Indian investment based on the stability in Syria despite the different circumstances based on the geo-political position and the geographical position on the Mediterranean and among the Arab countries. So this is what we hope from the visit. Mainly, according to our circumstances, the reason is political. I think you are planning to have a Metro Underground System for Damascus. I hope you can visit the metro during your visit, because that was built a few years ago and it's very impressive. President Assad: Was it built by an Indian company? Varadarajan: Yes, actually, it was a government company, and they put the best bureaucrat in charge, and in ten years he built a very extensive system and today something like many hundred thousand people use it. Anytime a foreign dignitary comes to India, he or she usually visits the metro. You are right, we have been discussing building a metro, but when we talk about India you only hear about the IT. The Indians are invading the whole world with their IT experts. Turning to other economic matters, one of our Indian public sector companies, OVL, has invested in the al Furat project. In fact, when we bought that share from the Canadian company, the Americans were very unhappy with India. They complained that we shouldn't do business in Syria. But our oil companies are eager to expand their presence here. Is there any prospect for Syria at some point in the future changing the terms of its production sharing agreement? Now there is a requirement that all extracted oil should be sold to the Syrian Petroleum Corporation (SPC). This is a very technical question, and I don't have the answer right now. We should ask the government about this. Again, it is technical not political. We are developing our system in Syria, but I don't know about this contract. But you are prepared to be quite flexible in terms of policy arrangements for the oil sector? Yes, of Course. That is what happened during the past few years. In the past everything used to go through the SPC. Now we have many other companies working without the SPC. 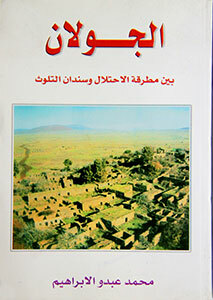 But as to how to sell it, this is what we have to study. Because we are liberalizing our market step by step, but about the oil and about the national sector, we have more opposition to liberalizing it. We have to be more careful. We have an emerging economy, a budding economy which is still weak. It is not strong enough and confident enough to be liberalized fully. What is the impact of the Syria Accountability Act, the sanctions against Syria? Has it hurt you in anyway? No, because we don't have real bilateral relations with the United States anyway. Most of our relations used to be with Europe and now with Asia. A few years ago we took a strategic direction to move towards Asia and even South America, which is south - south, but not with the United States. We have a few hundred thousand dollars in terms of trade balance. The effect is more political than economic. Turning to the US presidential elections, how do you think the outcome would affect the prospects of peace in Iraq and the withdrawal of American occupation forces there? Usually in Syria we don't bet on who is going to be the President of the United States, especially in a campaign. You don't listen to what they say during the campaign. We usually bet on the policies not speeches, but of course the common thing among those candidates is about the failure of the previous government or administration. This is very important. As long as they see the failure, they are not going to adopt the same doctrine or policy. This is very important for us. Now, how to find a solution? You cannot find a solution in the US. You have to make it in the region. If you want to make it in the region, you have to find out who are the main players: first of all, the Iraqis, and second the rest of the countries surrounding Iraq. They can help. You have to make discussions, to make dialogue. The problem with this administration is that they do not have dialogue even with their allies, in Europe or in the region, including the British first of all, who supported them in their war. So, what we heard from the Democrats, Obama and Hilary Clinton, was positive regarding the Iraqi issue, that you have to make dialogue, to have a political process in order to have withdrawal at the end. What we heard from McCain, that he is going to stay for a hundred years in Iraq: I don't think that's what you may hear from a politician usually, any politician, that he wants to stay one hundred years. But anyway, we have to wait until somebody is in the office. But do you think a clean and quick withdrawal is feasible militarily, and could it have adverse effects? This is not the debate, this is the wrong debate. I read it in the American media. It is not whether to leave or not. Now, after five years, they made the situation much worse, and it is getting worse everyday. If they withdraw right now, it is bad anyway. So, there is no difference if they leave or not. It is about the political process. First of all, they have to say that they are going to leave, but when and how, this is the question. They have to put a schedule, a certain timetable and at the same time you should have the political process. In that political process, you first have a dialogue, second constitution, third legitimate institutions and in parallel the withdrawal. This is the political process. So, it is not about the concept or the principle: are you going to withdraw or stay in Iraq. You have to withdraw, but how and when? If you use it the right way, if you answer how and when, you can leave Iraq with a better Iraq, not worse. Now they say, if we leave it is going to be worse. Of course, if you leave it like this it is going to be worse. Were you surprised by the statements that Mr Barack Obama made at the AIPAC meeting the other day? No. Again, this is a campaign. If you are in a campaign, you usually talk to your audience. So, AIPAC supports Israel, so it is normal for any candidate in the US to use this language in front of them. So, I wasn't surprised. Recently there was [Deputy Prime Minister] Mofaz in Israel raising the issue of the need to take military action against Iran. Is it something that you are afraid of, or do you think that is not a possibility. This is the biggest mistake anyone could make in Iran, whether Israel or the US. I think that the repercussions of this mistake are going to be huge and maybe for decades. On the other hand, they get angry when Ahmadinejad says that Israel is going to disappear. So, why do they have the right to say they are going to attack Iran? Disappear or not, they are using the same language. Iran said many times that this is a peaceful nuclear [programme], and as long as they follow international law, why be against them? They said it is peaceful and mentioned many times that they are going to cooperate with the IAEA, but the problem with some Europeans and with the American administration is that they don't want them to have what they have right to have: the fuel. There is no international law which says you cannot have [nuclear] fuel. This is the problem; and it is a national issue in Iran. So, what Mofaz said will make the situation for Israel before the rest of the world and the region worse. That is how we see it. Your Excellency, if we turn to domestic issues before we end, are you thinking, let's say in four to five years, of widening the scope of domestic political activities? I read a statement by you somewhere that there should be a greater role for the so-called patriotic opposition. What is your vision of political developments inside Syria for the next five years? President Assad: When I said we're going to have reform in Syria when I became president, this means every aspect of reform. You may say the main axes are the political, economic and social – upgrading society in general. Usually you move faster in the most urgent axis and where you can achieve more, where it is faster to move forward. The most urgent in Syria is the economic, because we have poverty; the second one is the political. When you talk about the opposition in the process of political reform, that depends on the laws. What laws are you going to have, and what circumstances you are living in today in order to have the good result that you are expecting from a good law, not like what happened in Algeria in 1988, when they had good laws, but they did not have good circumstances. So, they have been paying the price till today. Not like what happened in Lebanon. They have full democracy, but they have been moving from one civil war to another, from one conflict to another for more that 200 years. This is not our goal. What happened during the last seven years: I became president in August 2000, two months later the Intifada started, the conflict in Palestine started and has not stopped. It is getting worse everyday. The problem in Lebanon started in 2004. You have 9/11 after one year and we have the war in Iraq, which is the worst, in 2003. All these circumstances affected Syria directly. Usually in such circumstances you have tension, you have more closed minded people, you have more extremism. For example, we started seeing those terrorist attacks in Syria in 2004. We hadn't seen them since the early 1980s in Syria, especially al-Qaeda, who have the same roots as the Muslim Brothers who were in Syria in the 1980s. So, the whole society is affected. This means the whole political process is going to be affected. We used to think that many things would be implemented in 2005. We couldn't so far. And we have all this American pressure. This doesn't mean that we stop. Now we had the first private satellite TV station last year, the first political magazine three years ago, and now we have many private magazines in different fields. We have more freedom in Syria than before. We are moving slowly and cautiously. We have to be very frank and very clear about this. We don't move fast, and we cannot move fast. The next step is going to be the expansion of the participation of different currents in Syria by having an upper house of parliament, and we are discussing what kind of house will have more participation. Second, the local administration law: how to have freer and more dynamic elections around Syria. Third, and that is what we discussed in 2005 and we didn't discuss before, a new modern party law. This is the most important aspect of the political reform. Actually, we were supposed to do that in 2006, but the problem is that most difficulties started in 2005, after the assassination of Hariri and the embargo imposed by most countries in the region, in Europe and in the US on Syria. This is why we said we have different priorities. Now we started talking again about it. It is not going to be implemented in 2008 because we expect this year to be dangerous. We are going to wait and see what will happen with this administration, then we can discuss it. We are moving forward; and we are not talking about patriotic or not patriotic opposition. Many people want to participate, whether they are opposition or otherwise. I am talking about reform in general. We said that we have opposition but it is not legal because we don't have these laws, but it exists in Syria wherever you go, you can sit with them, you can criticize the government and the state in general, the officials. So, we are dealing positively with opposition, but it doesn't exist as a legal entity yet, because we need these laws for the opposition to be legitimate by law, but it is there and we deal with it as reality. You mentioned Algeria. Is one of your fears that too fast an opening politically may lead to the emergence of Islamist or sectarian parties? Sectarian, yes. You come from India. You have the same mosaic, but you have a successful democracy. For different reasons, it was not a successful democracy in Algeria. Maybe because you have different pillars of society. In our society, we have the Islamic pillar and the pan-Arabism pillar. We have many different currents, but none of them will lead: only these two will lead. If you don't have good relations between the pan-Arabism and the Islamic, you will have problems. And that's what happened maybe in the early 1960s. We had this division between the Islamic and the pan-Arabist. They looked at it as very secular; and in the past they used to think that secular meant atheist – against God, and this one supports God. So, they had conflict with each other. That is why it wasn't easy for us to have real democracy. This is one of the reasons of course. Now you need to have good relations in order to have democracy. This is one of the main issues, but many in the west don't understand the relationship between the Islamic and the pan-Arab pillars. Within Syria, the role of Islamic social charity organizations like the Qubaysis and so on is increasing. Could these eventually emerge as political trends? Are you looking at that as a possibility? No, no sectarian current is allowed to be politicized. This is for the security of our region and our country. We cannot allow that. And that law will never change? No, they have the right to practice any kind of activity related to Islamic teachings but not in politics. Politics in Syria has its rules and laws. One last question. There is the case of a Syrian – Canadian individual called Maher Arar [who was arrested in the U.S. in 2002 and handed over to Syria for interrogation]. You must have read about him. Now, his case is finally being investigated in the USA to see whether the U.S. violated its own laws. The paradox is that on the one hand, the Americans accuse Syria of human rights violations and then they send someone here to be mistreated. What happened with him? We hadn't known anything about this man. After 9/11, we started the first cooperation between Syria and the USA in the security field. One of their messages was about a terrorist called Maher Arar who was coming to Syria, and they wanted Syria to catch him because he is al-Qaeda member. We caught him according to American information, and we trusted the information at that time. So, we put him in prison. After the investigation, we arrived at the conclusion that he is not an al-Qaeda member, so we freed him. He accused Syria, and Canada accused Syria, while they must accuse the USA. This is the price of cooperating with the USA! So, we don't have anything to do with him. But are you prepared to share any information you have about which American officials contacted you to have him detained here? So, if there is a legal process, then you will be willing to cooperate? Of course, we do not have anything to do with him. It is an American issue. They asked Syria to cooperate, and we caught him. And is there any ongoing security cooperation of this kind, or has that come to an end? President Assad: No, it has completely stopped. We cannot have security cooperation while we don't have political cooperation. We said no, and were very frank in this context: we told them when we have political cooperation we are ready for any other aspect of cooperation, including security cooperation. Now, there is no cooperation at all; and we are not ready for it yet. We have to wait for another administration and another policy. We are not very optimistic, but it is definitely going to be better. I don't think we can have worse than this policy in the modern history of the USA and the history of the world. On that note, thank you very much. Thank you very much for coming to Syria.